IPL 2019: CSK is in a good space midway into the tournament and would hope they do not allow the momentum to slip. 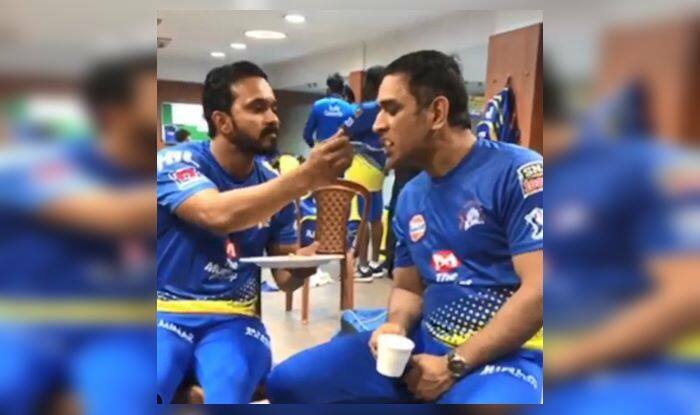 IPL: Kedar Jadhav feeding a sleepy MS Dhoni is probably the cutest thing thus far in the ongoing IPL season. It happened after CSK beat KKR by five wickets at Eden Gardens. Dhoni seemed to be having a cup of coffee while Kedar had the dinner plate in his hand and he started serving Dhoni with the spoon. The two cricketers have known each other for a long time now and share a great camaraderie among themselves. It seems the CSK camp is in a good space after winning the match and cementing their stronghold at the top of the table. Here is the video shared by Kedar Jadhav on his Instagram account: He captioned it, “Bromance ❤️”. Meanwhile, Dhoni has been in ominous touch this season. He has been timing the ball better than before and things also look ideal from an Indian perspective as the Men in Blue will soon be playing the World Cup in England and the 37-year-old will be a massive part in the mix. Earlier in the day, Imran Tahir and Suresh Raina helped Chennai Super Kings (CSK) put one foot in the playoffs as they got past Kolkata Knight Riders (KKR) by five wickets in their Indian Premier League (IPL) return leg fixture at the Eden Gardens here on Sunday. With seven wins from eight games, CSK has gone from strength to strength. With the playoff spot almost secured they could look to try out a few combinations ahead of the knockouts. On the other hand, KKR has lost three in a row. Interestingly, the last 10 matches in this tournament have been won by teams chasing. That is something to watch out for other teams.